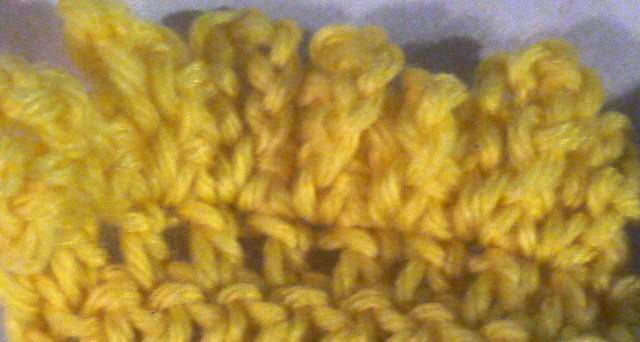 Crochet edges add the finishing touches to your work. 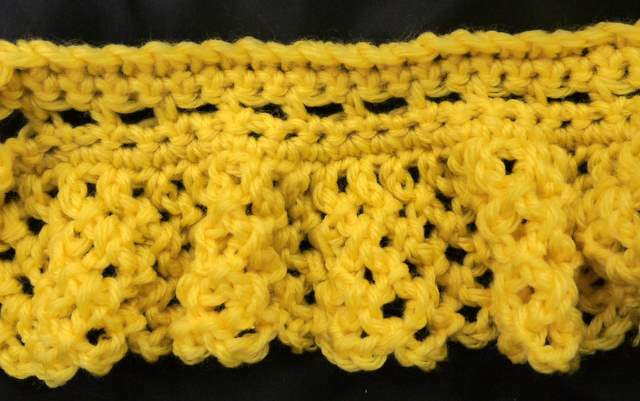 You can also make up crocheted edgings to stitch onto fabric items such as tablecloths. 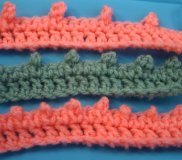 You can use fancy edgings or if you just want to give a neat and firm edge to an item you can simply work a row of single crochet (UK double crochet) or a row of crab stitch which is simply single crochet worked backwards. Edgings can also hide things you don't want to see, especially if you are working in more than one colour - loose ends and and yarn taken up the sides of your work are hidden by a well constructed edging. Curlicue edging - pretty ringlets which are deceptively easy to work. Picot edgings - simple and neat, these add interest without being too fussy. Other ideas for finishing off are to use tassles, pom poms or fringes. these are especially useful for scarves and ponchos. or if you are a whizz with a needle and thread or a sewing machine you could bind your edges with a contrasting or matching fabric.